I could tell you all about the Canada Geese. How they nested on the lake and hatched goslings. Six yellow balls of sweet fluff and fur who are just recently looking more like gawky adolescents than the adorable innocent newborns that they once were. And –the Mallards. I could tell you about them too. Just this week – their ducklings appeared..out of nowhere. Ten of them – to be exact. Each identical to the other – pale yellow with grey/black markings and stripes. Teeny..tiny…and attached to their mother… holding on to her and to one another. Following as an almost singular unit..in one straight line. There’s the regal Blue Heron. Yes…of course. He sits. Still. Endlessly and for hours. Concentrating and hyper-focused….patiently fishing for his next meal. The slightest ripple..a change in light. He’s right on it. I could tell you about how it is when he takes flight. About his elegance and grace. About the sound of his wings as they float through the air. 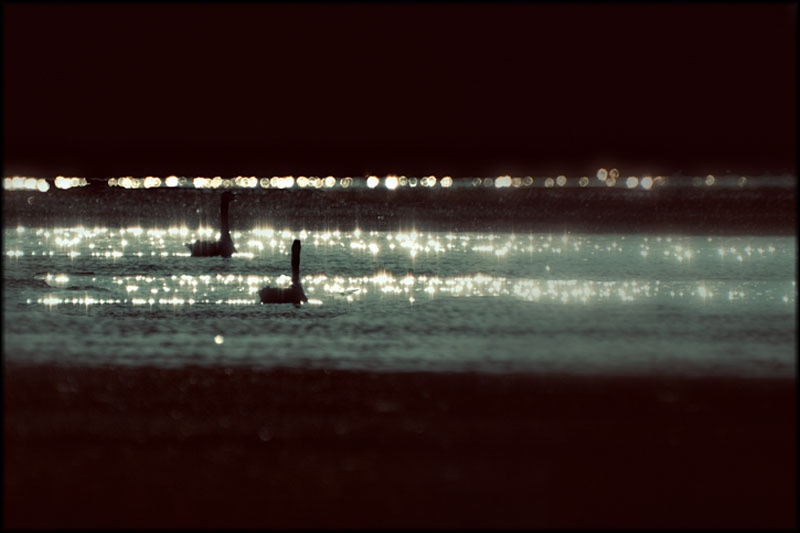 And then..and of course and least I forget – in another far corner – the glorious white Swans. Waiting. Still waiting. One – sitting patiently..endlessly.. warming her nest. The other – out and about patrolling… keeping any and all predators at bay. Foraging for food and bringing it back. Protecting..nurturing…perhaps even loving – both his soon-to-be-hatched cygnets ..as well as his life-partner and mate. I could tell you about the sun’s rise. About the magical mist and exquisite light. I could tell you about those days that are overcast and grey..when all is softer and more forgiving. With the click of the shutter – I can capture all that. I could tell you..show you the world as I see it thru my camera’s lens. But – how can I describe to you the quiet…the peace…the sense that – in that particular moment – all is perfectly right with the world. That nothing is wrong. That the universe is vast..and the possibilities are endless. How can I tell you about all of that? How can I tell you how it is to be lost..and all at once and the same time to be found. To be so awake alive and aware..to feel everything and feel nothing at all. To simply breathe in the beauty. Because there is nothing else that truly matters. Just this. Today. Now. Yesterday was. Tomorrow will be. Today - simply – ‘is’. How is it that I can tell you about the things that can’t be seen or heard or touched or tasted – even? The intangible? The indescribable? That for which there are no images..there are no words? How is it that I can tell you about the feeling….??? Cross-posted over at Vision and Verb- where a collaborative group of like-minded women from all over the world share their passion for photography and the written word.